We left the forested city of Spokane, Washington and headed south on interstate 90, then onto 395. 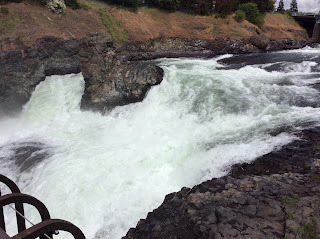 The further we got from Spokane, the more the land opened up…water everywhere, and green, grassy rolling hills. Far off in the distance I thought I caught a glimpse of Mount Rainier. As we reached Pasco, we got our first view of the Columbia and Snake Rivers. It was here that we saw vineyards along the banks of the Columbia and far off on the hillsides of Horse Heaven Hills. For this trip, we chose to focus on the Walla Walla area of the Columbia River Valley. The previous night we had met up with old friends at the Wolf Lodge in Couer D’Alene, Idaho. They brought a bottle of Va Piano Cabernet Sauvignon, and we added a bottle L’Ecole No.41 Cabernet to complement our steak dinners. They advised us on some wineries to visit on our trip down, and to avoid what looked like the shortest route to Walla Walla. While more direct, the backroads are windy country roads. As it was, the trip from Spokane to Walla Walla took just about 2 hours and 45 minutes. It has been 30 years since I was last in Walla Walla. I’m sure they must have been growing grapes back then, but I certainly don’t recall the town being a wine town. Now there are over 80 wineries located in Walla Walla, spread across five “tasting districts”: Westside, Downtown, Southside, Eastside, and Airport. A sixth district would be the wineries located in Oregon, which are literally a block or two from some of the Southside wineries. As we drove to the wine region, you can help but notice the basalt rock outcroppings, reminding you that this region was dramatically influenced by volcanic action. The volcanic and sandy loam soil have the great drainage that grape vines love. Most wineries refer to their vineyards as having soils of loess (pronounced “luhss”), made up of wind-blown deposits of sand and silt. The other large influences are those of the Columbia River, Snake River, Yakima River and Walla Walla River. This area would be a desert, in the rain shadow of the Cascade mountain range, if not for the availability of water. The Columbia Valley AVA has nine smaller AVA’s within its’ large boundaries: Ancient Lakes AVA, Horse Heaven Hills AVA, Lake Chelan AVA, Rattlesnake Hills AVA, Red Mountain AVA, Snipes Mountain AVA Walla Walla Valley AVA, Wahluke Slope AVA, and Yakima Valley AVA. Most people think of Washington as being so far north, that they shouldn’t be able to grow great wine grapes. However, when you look at a map of the world, the Columbia Valley AVA is located at the same latitude as Bordeaux, France. Being this far north gives the grapes more daylight hours during the growing season. As in Bordeaux, this is Cabernet Sauvignon country, but Merlot, Chardonnay, Syrah, and numerous other grape varieties are grown. We entered Walla Walla from the west, along Hwy 12, driving through dips and valleys that influence the weather in this region. Pockets of colder air settle into the valleys, and flow into the open areas. This day the weather was warm, but they were expecting a heatwave into the 90’s within a few days. The first winery we came to was the iconic L’Ecole No.41. This wine tasting room is located in an old (1945) school house (just as depicted on their wine label). Founded in 1983, they are the third oldest winery in the region, only preceded by Leonetti Cellars and Woodward Canyon Winery. What a great way to start the day. The comfortable tasting room has plenty of space to enjoy your tasting. The tasting staff was friendly and guided us through their wines, and showed us maps, locating their vineyard sources. I came here for their Cabernet Sauvignon, which did not disappoint. The Apogee, Ferguson and Perigee were all perfect examples of this AVA: dark cherry, cassis, herbal tones of tobacco, and well-structured tannins, making for great wines to cellar. They also have some interesting Semillon and Chenin Blanc, but one standout for me was their Grenache Rosé. Luckily, they offer shipping to California, and with the hot weather that was anticipated, for a couple extra dollars, they ship with cold packs. All my wine arrived safely and cool. Our next stop was just down the road at Cougar Crest Winery. Here they have a large selection of wines to purchase and taste, including the normal mix for the area, plus Tempranillo, Malbec, traditional Port grapes and Viognier. We were the only people in the tasting room, so got full attention from the two tasting room people. We tasted many of the wine available for sale, and enjoyed the tasting room atmosphere with their winery cat, and gift shop. It has been two weeks, and I haven’t seen my shipment of wine yet. We’ll see how it eventually arrives. 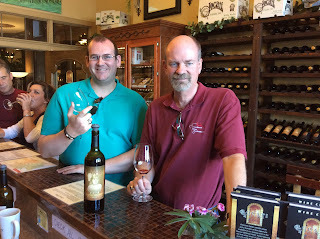 Next we went to the Southside District of Walla Walla, and visited Va Piano Vineyards. This winery sits right on the border of Washington and Oregon, surrounded by vineyards. This winery has a large following, based on the number of people we saw having lunch in their picnic area, and the packed tasting room located in what looks like a Tuscan villa. And, for good reason…the wines are very nice! They offered two different tasting flights, so we did both, by splitting our tasting between two people. The regular flight was only $10 (as it was at every winery we tasted). The reserve flight was $20. Don’t let anyone tell you different, there is a difference between the current releases and the reserve releases. Almost everything we purchased was from the reserve list. Just like L’Ecole No. 41, these wines are perfect for cellaring. Big, dark fruit and tasty. My shipment also has not yet arrived, but they did call, and say they would wait for the weather to cool a bit before shipping. 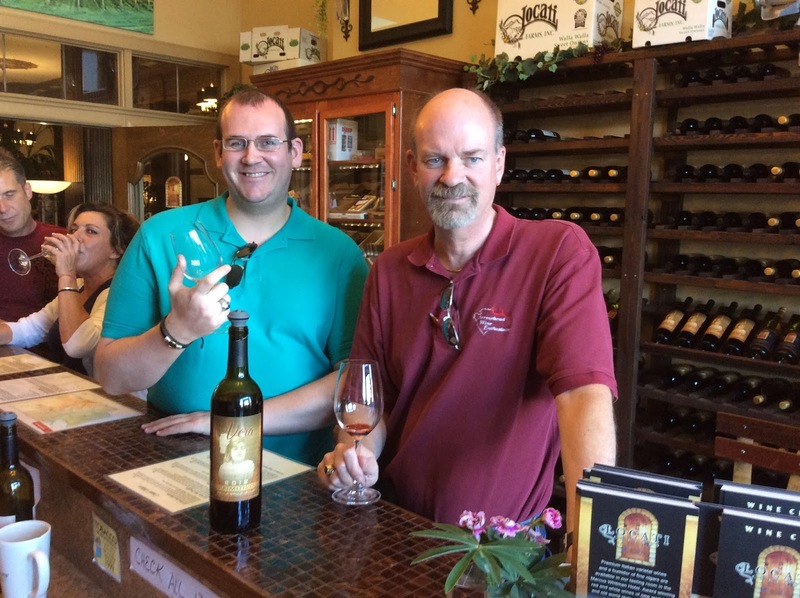 After a quick bite to eat in the downtown area, we stopped at Locati Cellars, located in the Marcus Whitman Hotel, right in the heart of downtown. We stopped here to see what other grape varieties tasted like in the region. As you might have guessed by their name, these were Italian grape varieties. Pinot Grigio, Sangiovese, Barbera, Dolcetto and Primitivo, are just some of the available wines. We were told that all their wines were actually produced in Oregon, just a few blocks away, and the family has been producing wine for a century. These Italian varieties have great acidity to them, and make for great food wines. Their prices are also very good. The most expensive wine on their list was the Primitivo at $35…and for good reason….tons of fruit and smooth tannins. All wines shipped and arrived in good condition. Also, when we got home, I noticed we were on their facebook page. Our last wine tasting was in the Eastside District, at Tranche Cellars. At first, we thought for sure that our GPS was off. We drove through a residential area, winding around the roads, and then made a left turn into a large vineyard, and in the center was a very modern looking building. This wine tasting experience was different that the previous four. It didn’t have the same quaint feeling we had in the other tasting rooms. This was modern, and stark. The wines were based on Bordeaux and Rhone varieties (including: Grenache Blanc, Roussanne, Marsanne, Viognier, Picpoul Blanc, Clairette Blanche, Syrah, Grenache, Mourvèdre, Cinsault and Counoise). Once again, we had the wines shipped. They arrived within a week. The wines were warm, so I immediately cooled them down, and we’ll have to see how they did. Lastly, we drove around the Airport district. It was getting late in the day, and we had to head back to Spokane. So, no tastings, but wanted to see what this area had to offer. Here we found about 12 wine tasting rooms, concentrated within a few blocks of each other. You could spend all day parked in one spot, and visit numerous wineries. On top of that, the airport is right there, and Alaska Airlines is offering to check-in your first case of Washington wine at no cost. This is perfect for anyone visiting the area.